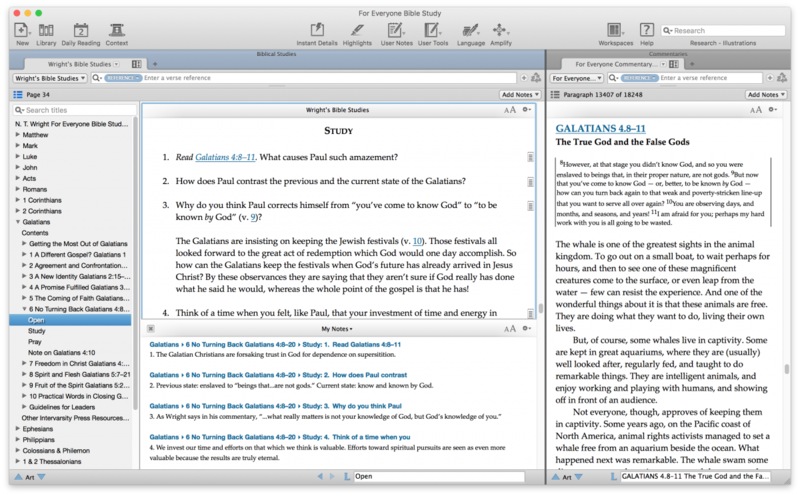 We've talked about this before, but it's worth repeating: now that you can take notes in any title in Accordance (forthcoming for Accordance Mobile), Accordance is a great tool for group Bible study. I believe this will be even more beneficial once the notes-everywhere feature is available for Accordance Mobile, since a tablet in a group setting might be more accommodating than a laptop; but Windows tablets would certainly work fine right now. Not intended to be. That feature is a priority for Accordance Mobile and will eventually be here, but I have no date. I created the screenshot for social media promotion today, and as I reflected on it, I was just struck by how awesome the whole thing is. So I shared it here. That is a pretty sweet Workspace. I've been wondering if this could be applied to language workbooks to answer exercises. I think it could. I prefer long hand myself but the question of workbooks in Acc. has come up before. I agree, but I don't mean that in a bragging sense. I was just looking at the screen and the more I thought about it, the more awesome I thought it was. I've been using Accordance for 17 years and even work for the company now, but I still get excited about this stuff. Absolutely! Check out my post, "Answering Grammar Exercises in Accordance" that I wrote earlier this summer.